LOS ANGELES (AP) — Andrew Lloyd Webber has written some of the most successful stage musicals of all time. So, when he weighs in on the year’s Tony contenders, announced earlier this week, it’s time to listen. “The Band’s Visit,” from composer David Yazbek, is based on an Israeli film about an Egyptian police band lost in a small Israeli town. The musical this week was among year’s top Tony nominees. Lloyd Webber himself is part of the latest Tonys mix. He and actress Chita Rivera each will receive 2018 awards for Lifetime Achievement. 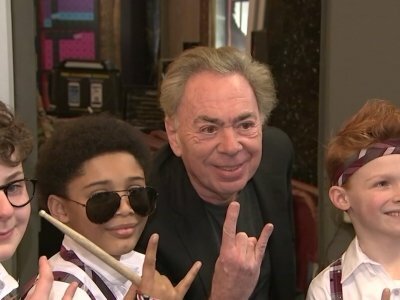 Lloyd Webber was at the Hollywood Pantages theater this week to promote the Los Angeles premiere of his Broadway and London hit “School of Rock — The Musical,” based on the 2003 movie that starred Jack Black as a down-and-out musician who stumbles into a gig as a prep-school teacher. Lloyd Webber said he originally only planned to produce the project, but found the show’s pop-rock sensibility so appealing that he ended up as the show’s composer. As for his next show, Lloyd Webber seemed eager to discuss it — but just can’t. He said its fate is currently in the hands of higher powers — in this case, rights holders. It’s the same story with one of his passion projects: a film version of his musical adaptation of the 1950 film-noir classic “Sunset Boulevard.” Paramount first announced it was in the works __ way back in 2005. Lloyd Webber, who turned 70 in March, has written a recently published autobiography that ends with “Phantom” and covers the first part of his life. Los Angeles newsperson Robert Jablon contributed to this story.